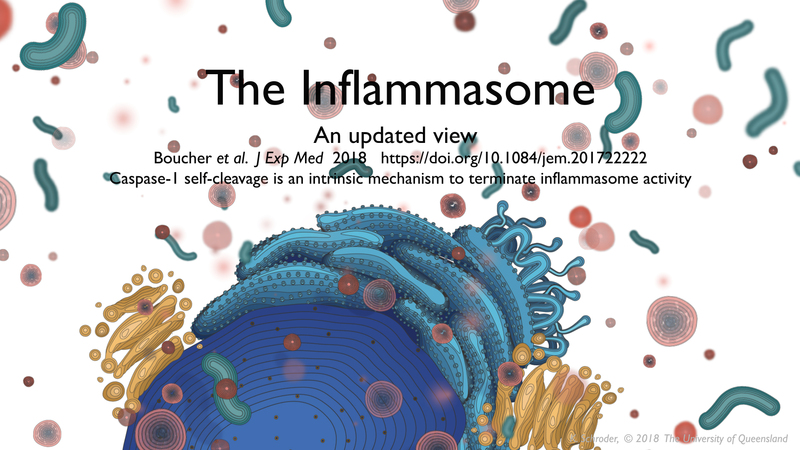 The Inflammasome Lab have uncovered precisely how caspase-1 is activated upon inflammasomes, which has revealed a new model for inflammasome signalling, function, and signal shutdown. We describe our updated view of the inflammasome signalling pathway in this animated film. Associate Professor Kate Schroder explains the signal transduction pathway of inflammasomes - molecular machines at the heart of host defence, inflammation and disease - that signal via an elegant self-limiting mechanism. © 2017 The University of Queensland. This film may be reproduced and communicated to the public (in whole or in part) for non-commercial research, education or study purposes only, provided all copyright and attribution notices appear in the copied or communicated film. Subject to exceptions mandated by law, this film many not otherwise be reproduced or communicated to the public without the written permission of The University of Queensland. For commercial use of this film, please contact Kate Schroder (K.Schroder@uq.edu.au). Boucher D, Monteleone M1, Coll RC1, Chen KW1, Ross CM, Teo JL, Gomez GA, Holley CL, Bierschenk D, Stacey KJ, Yap AS, Bezbradica JS and Schroder K (2018).